Alaskans living in Anchorage know winter is coming as soon as the snow returns to the Chugach Mountain peaks. The snow appeared this past week after we had a rain and wind storm. 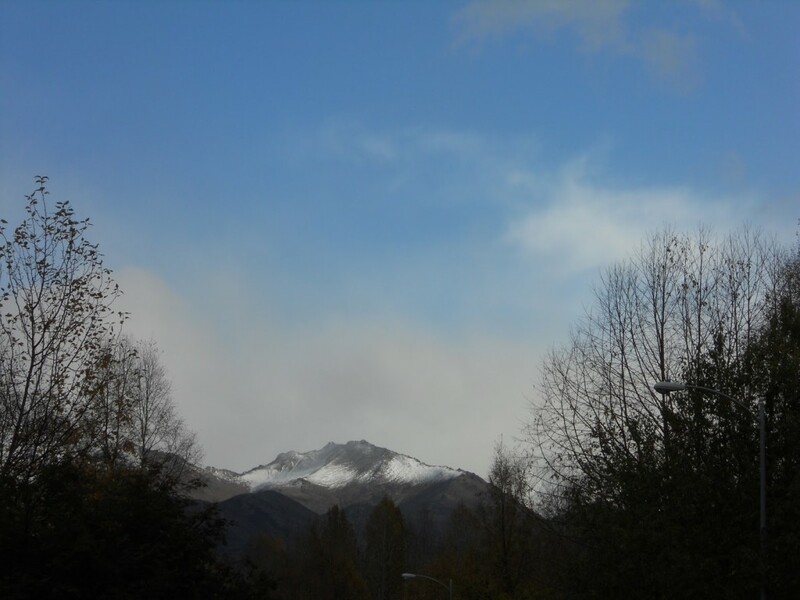 This picture taken in our Anchorage neighborhood shows this year’s “termination dust” on the Chugach Mountains. We, “sourdoughs”, say we have ”termination dust” on the mountains. A sourdough is a person who has been through at least one entire winter in Alaska. Craig and I lived outside of Fairbanks in the “suburbs” of North Pole for five winters, as well as glorious hot summers. After that we more than qualified as sourdoughs. Someone new to Alaska is a Chechako. Many Alaskans have the custom of removing their shoes after they enter their home. It is hard to determine where this very practical custom started. In Fairbanks everyone did it mainly because no one clumped around in their heavy “bunny” boots. These are insulated very warm boots. Once we came to Anchorage it seemed the shoe removal custom was also present. It certainly keeps volcanic ash off the carpets when we have had nearby eruptions. It also keeps the sand from all the winter road sanding out of our homes. We observe this custom at Camai Bed and Breakfast as do many of the other Anchorage Alaska Bed and Breakfast Association members. Perhaps the bottom line to the shoe removal is many Alaskans have the attitude that they don’t care how it’s done “outside.” The “outside” refers to all the other 49 states. Alaskans seem to do what best suits our situation.